4" hammer-forged stainless steel barrel ... striker fire ... weight 27. oz ... L 7.25"; H 5.5"; W 1.35" ... rate of twist 1:16" LH ... 3 x 14 round magazines ... trigger pull 5.5 lbs to 7.7 lbs ... comes with 1 extra back straps for 2 grip sizes ... ultra non-slip checkered grips ... ALL operating controls are fully ambidextrous: slide stop, magazine release, manual safety ... ultra-hard black coating on stainless steel slide ... 3 dot NIGHT sights with deep rear sight notch ... FOUR major safeties: trigger safety, firing pin safety, drop safety & out-of-battery safety. Manufactured in the U.S.A. The FNS-40 features a pre-loaded striker mechanism and a manual safety, hence combining fast and accurate shooting and optimal safety. This is a well thought out design that results in a stable, highly ergonomic and totally ambidextrous pistol that is easy to operate. We feel this gun is superior to Glock because of the adjustable ergonomics that allow the gun to be fitted to the shooter's hand and superior to Glock because of the manual safety which the shooter can choose to use or choose to not use. 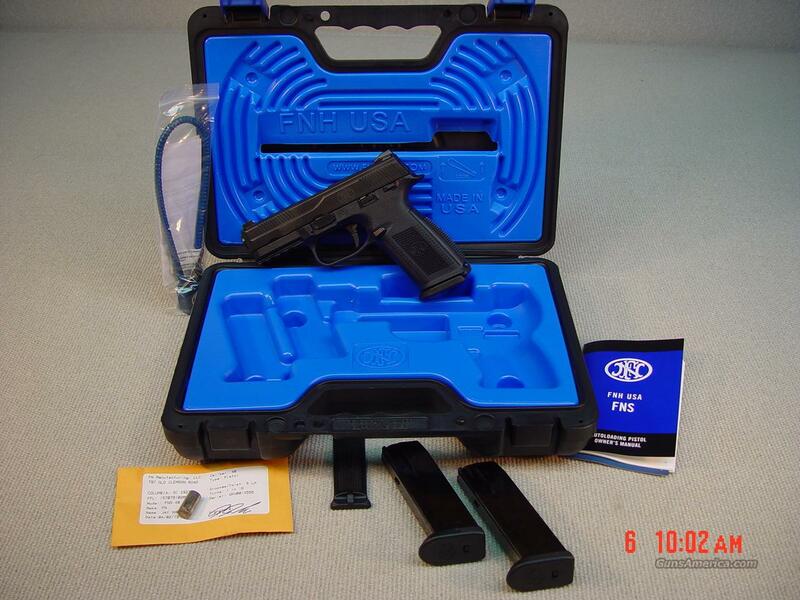 The gun comes factory new in a lockable molded hard shell case with owner's manual, gun lock, factory fired shell casing and extra magazines. Call with any questions and see our other listings for ... "Only the best!"